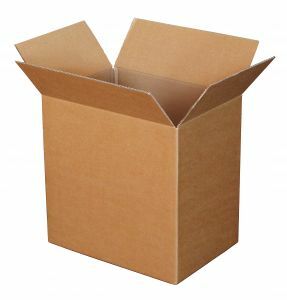 Industry standard packing case, the most common type of packing box used. The box will be manufactured to suit the specific length, width and depth of your product to ensure an excellent fit. It does not require tooling to produce (except for extremely small cases). We can produce packing cases in a wide range of fluting profiles (B, C, E, BC, EB and others). This means we can tailor the box to offer the right amount of protection for your product at the right price. The cheapest option is to have a glued case manufactured plain in a brown board (simple, very effective and easiest on the bottom line). We can also produce in Mottled or White board too and as alternative to glue we can stitch (staple) the cases. The addition of a 1 or 2 colour print to brand the boxes is an inexpensive way of increasing brand awareness and offers a more professional finish when arriving with your customer. See our print page for details and examples. Once manufactured each bundle is strapped and palletised. The boxes are flat packed, simply pop them up and close using the flaps provided, taping to seal. Unlike packaging merchants where you will need select the closest size so you may be shipping fresh air or risking your product moving around in transit we can produce a ‘perfect fit’ case.